These photos represent only a small fraction of my work. They are presented in chronological order and are updated frequently; please press reload for most current offering. 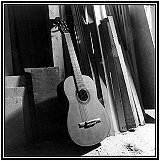 I attended the Violin-Making School of America for three years. My experience there provided me with what is probably the most thorough grounding in hand tools available today. Although I chose not to pursue instrument-making professionally, I still consider this experience to be the foundation for everything that follows in my study of woodworking and design. 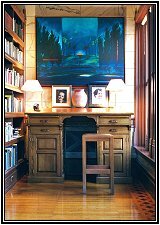 The reproduction table along the wall reflects my study of a Ming Dynasty classic. The dining table is a blend of these classical elements with the requirements of a modern dining table. The Ming Dynasty furniture-maker approached the craft with a humility borne of a profound sense of tradition, elaborating within existing themes and values, achieving an almost mystical sense of proportion and balance. I am often asked to reproduce pieces built with various modifications to suit a specific need or purpose. The wardrobe pictured here was one of two built to hold large reference books and manuals. Unable to find Ming Dynasty reproduction hardware, I cast and assembled these pulls myself. A Frank Lloyd Wright design circa 1904, an original of which is part of the permanent collection of the Museum of Modern Art in New York City and displayed as a milestone of twentieth century design. 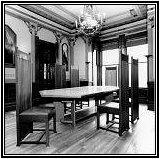 This client commissioned me to combine the elements of three of Mr.Wright's chairs into one design which would allow a clean transition from their original Wright dining table to the Victorian motif of the walls and ceiling of the dining room. All the furniture in this photograph was based upon furniture designed by Mr.Wright, but for three different homes. 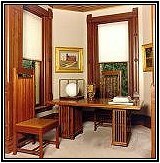 The library desk in the center was based on a piece originally built for the Evans home; it is part of the permanent collection of the Art Institute of Chicago. A faithfully reproduced architect's desk, circa 1880, designed originally for working from a standing position, built of solid oak, with a leather panel insert. A wonderful opportunity to connect with the grand tradition of woodworking. 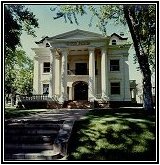 The David Keith mansion, designed in 1897 by architect Alexander Hale, who borrowed heavily from Palladio in its concept, is situated on South Temple Street in Salt Lake City. The landmark was virtually gutted by a tragic fire on Christmas Eve, 1987. 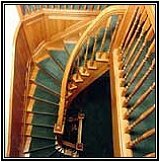 I was invited to restore the staircase up which the fire had traveled. 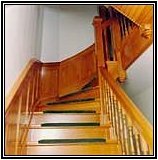 Although the damage to the staircase was extensive, the unexposed portion of the housed stringers under the treads and risers were undamaged, enabling me to use them as guides in relocating the new staircase. The project required obtaining permission from the city to rebuild the original winding turns as they did not comply with our modern building code. Most of the work could be done with the aid of power tools, but there were many instances where the best or only approach demanded the use of traditional hand tools. The underside of the upper flight, comprised of tongue and groove bead board fanning out under the stairs, provides the lower flight with a wooden ceiling. In effect, giving the climber the sense climbing up through a tunnel of quarter-sawn white oak. 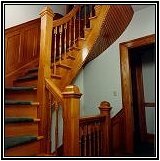 The second flight begins with a winding corner built into an unsupported newell post and carries through the final quarter turn on a curved open stringer from the post to the third floor. 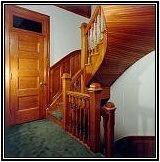 This view from the third floor landing shows why it was necessary to hand carve the center section of the handrail from a rather large oak blank held up by the balusters through a twisting turn. 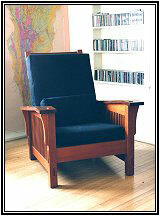 The chair pictured here is based on Wright's 1904 design for the Darwin Martin House. It is arguably the most comfortable of all of his chairs. 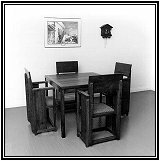 As Gustav Stickley's furniture has become very popular I have found myself building in the language unique to his style. 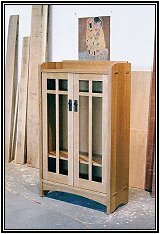 This bookcase is a combination of various Stickley themes and dimensioned to fit into a specific space. 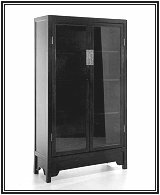 Although it is not a direct reproduction, it maintains the integrity of the "Craftsman"style. 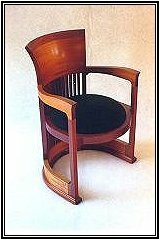 Also attributed to Gustav Stickley is this "Morris" chair, first popularized by William Morris, one of the founding fathers of the English Arts & Crafts movement, precursor to the American Arts & Crafts movement.